Mattel has done an almost entirely hideous job with its DC Superheroes line. Though it was touted as a "collector-friendly" line, each series is packed with variation after variation. The line began well, but quickly succumbed to Mattel's usual poor business sense. Shelves clogged with insipid, unsellable variations, while the worthwhile figures were shortpacked and flew off shelves. Have you ever seen a Cyborg Superman? Have you even seen a hint of the Batman-themed DCSH Series 7? Of course not. And yet they're supposedly "out," improbable as that may seem. Part of the problem was the constant re-jiggering of the series. The original plan called for Batman and Superman to alternate, but that fell apart only four series in, when Superman followed Superman and was followed by Superman. That left Batman in the lurch, even though we had a good idea of what figures we were supposed to see in his assortments. Two-Face. Batgirl. Catwoman. 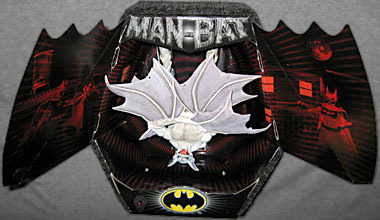 Man-Bat. Sadly, these much-anticipated figures got pushed back, and in at least one case, there's some question as to whether we'll ever see it at all. Wayne Industries employee Dr. Kirk Langstrom desires power and control. To this end, he's created a serum that transforms him into the very creatures he's spent his life studying... bats! Langstrom kept a scrapbook of Batman's exploits, admiring the fear he generates. When transformed into Man-Bat, the insane Langstrom is a difficult and cunning opponent for The Batman. Smart readers will notice the bio we provided up there refers to the version of Man-Bat seen on WB's The Batman cartoon, rather than the one from the comics. Yes, this is basically the same figure that was due to be released at the end 2006, but given a new colorscheme to be an SDCC '07 exclusive. And since the new color is white, logic suggests this is supposed to be a realistic interpretation of The Batman's Man-Bat. You can barely mention a Mattel con exclusive without going into detail about the packaging, which seems to get more involved every year. We started with the Batcave, then a bank vault and finally a complete street and sewer diorama. This year's exclusive steps things up another notch. 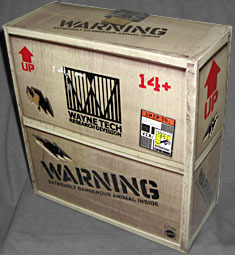 The box looks like a Waynetech Research Division shipping crate, with big stenciled warning labels letting us know of the "extremely dangerous animal inside." The top has a heavy padlock, while the creature inside seems to have broken holes in all sides of the crate. It's addressed to Arkham Aylum via San Diego Comic-Con International. This box is 9½" wide, 10½" tall and 4" deep. When you open the crate (thankfully, you don't need a crowbar for this step), you'll first find a fax from Lucius Fox to Dr. Amadeus Arkham, explaining the contents. Beneath that, you'll find something... furry? Yes, the interior box is covered almost entirely by black fur. This isn't flocked, it's almost upholstered! 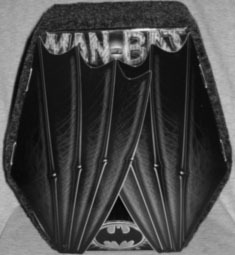 The only exposed bits are the two front flaps, which are simple printed cardboard folded over to resemble bat wings. In fact, the general presentation of this box is that of a bat hanging upside down. Spread the "wings" and you're in for a surprise - Man-Bat shrieks at you and a small red light illuminates the interior of the packaging. We really can't stress just how ear-splitting that shriek is; be prepared before you open the box. Judging by the ghostly crimson images of Batman and Batgirl on the flaps, the sound and light are supposed to represent Man-Bat's echolocation ability. The figure itself is packaged upside down at this point, matching the coffin-like box. He's held in his tray by rubber bands and a twist tie, so it's possible to remove him for play, then put him back in when you're done. Always a plus. All that's cool, but a neat box does't mean squat if the figure inside is poop. Man-Bat is pretty good overall, but he does have a few problem spots. We'll get to those in a few minutes; for now, the good. The Four Horsemen did a fantastic job on the sculpt, as always. The muscles in Man-Bat's torso aren't quite human, which is as it should be, and every bit of his skin is marred by thin cracks, making it look wonderfully leathery. The proportions on his arms are wonky, befitting a bat, and while his wings may not be 100% true to the animal kingdom, but he's not a real bat: his condition is the result of a mutating serum, so some oddities are expected. Nice job having the outside fingers on each hand extend down to be part of the wings, though. 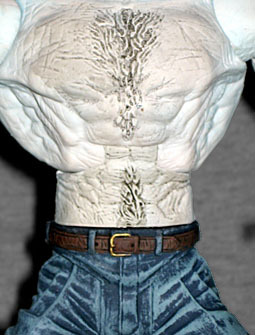 Langstrom was obviously wearing jeans when he transformed, because the remains of them are still clinging to his legs. They only cover down to where a man's calves would be, at which point they're replaced by Man-Bat's big, crooked animal legs. The jeans and the belt holding them up have different textures, and in the spots where the fabric is ripped and the leg is showing through, you can see the fur that continues onto his shins. There's also sculpted hair running up to his chest. As you can tell, a very intricate sculpt. Unexpectedly, the big crest of hair on the ridge over his spine isn't sculpted - well, not entirely. The large clumps of it are sculpted, but not the fine detail work. Why not? Because it's been flocked. Yes, that's real fuzz on there. Man-Bat is actually furry! Neat! Of course, the flock is already wearing off, but it's still an interesting bonus. The paint could be better. 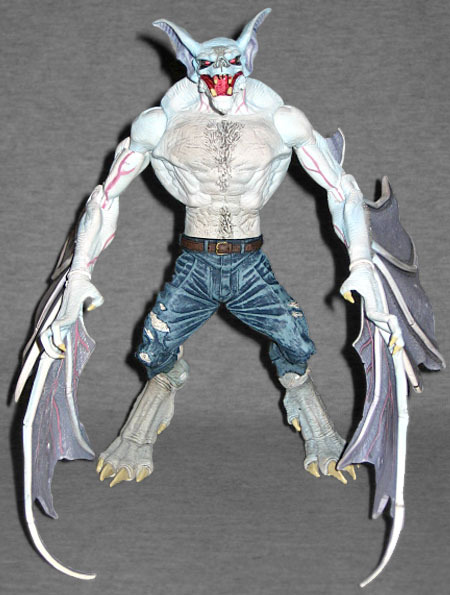 Since this is the mostly albinic version of Man-Bat, Mattel gave him a wash to bring out the detail: on the arms, hands and back, it's the light blue ToyBiz loved so much; on the chest and legs, it's a heavier gray. The head gets a mix, with blue on the back and big gray smudges on the face. Man-Bat's red eyes rest in dark black sockets, and his mouth is open to reveal his bright tongue. His wings are lavender, and his ears have a similar wash. The veins on his arms and neck are a vibrant pink, while his nails are slightly yellowed. Honestly, the colors chosen work nicely - it's just the application of the washes that could use some work. 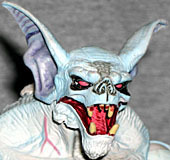 Why did Mattel go with the white Man-Bat instead of the traditional brown? Because it offers better contrast against the dark interior of the box, and catches the red lights better. There's a chase variant of this exclusive (of course), which sees Man-Bat cast entirely in translucent plastic, so he lights up even more than usual when you open the flaps. Besides, if they'd made the brown bat the exclusive, you'd probably be hearing tons of complaints about how you had to pay scalper prices to get a major villain... not that that would be anything new for the DCSH line. It's hard to list a height for this figure, since his bestial anatomy lends itself to a lot of small variations in the posing, but rest assured he's bigger than Batman. Call it 6⅝" tall, with a little more depending on how you set his legs and the way his head is tilted - those ears will add some height if he's looking down. Man-Bat moves at the ankles, knees, hips, waist, torso, head, shoulders, biceps, elbows and wrists. The neck and wrists are balljoints, the waist, hips and biceps are swivels, and the rest are hinges. And it's here we come to one of the figure's bigger problems. It's hard to make Man-Bat stand, but that's always been true of every Man-Bat figure. There isn't a single one that could stand without leaning on his wings for support - at least, not until now. If you pose him right, this Man-Bat will stand with nothing but his feet touching the floor. Good thing, too, since Mattel's Man-Bat uses softer plastic for the wings, so the weight of the figure could make them warp if they were expected to support the figure. But even worse, that soft plastic seems to be used all the way up the arms, making the wrists and especially the biceps problematic. Yes, they couldn't use harder plastic because some kid might poke an eye out, but is that really a concern with a convention-exclusive toy? The part that really makes me nervous is the peg that holds the upper arm onto the shoulder balljoint: that part of a figures takes a lot of stress when you move the arm, especially when the shoulder is really tight (admit it, you turn the shoulders by grabbing the arms, not the balljoint), and while the peg looks like it would be thick enough to keep that from being an issue, it's only about half as thick by the time it actually gets into the arm. Somebody is going to be posing their Man-Bat, and that thing is going to rip off. Tell me that wouldn't leave a sour taste in your mouth if it happened to you. You drop big bucks on a con exclusive, you don't want it coming apart in your hands. Man-Bat will be a nice addition to the DCSH ranks... if they ever actually get around to releasing him. After being pushed back a year, he was eventually dropped from the 2007 schedule entirely. Now there's talk he'll be a BAF in the new, expanded DC Universe Classics line. Honestly, half the reason I went for this exclusive was that as a fan and a collector, I just can't trust Mattel to not screw up the property and turn the line into a failure before the brown version shows up. They've done it before. Three times, now. How sad is that? When you can't count on a company to produce figures that will sell because they're too busy producing ones that won't? 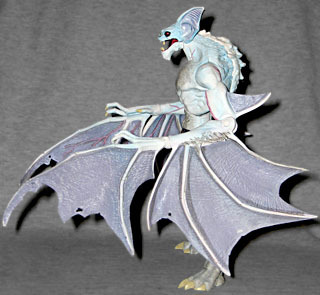 Even in white, however, Man-Bat is a good figure. Yeah, the paint isn't perfect and the shoulder joints are worrisome, but the Four Horsemen did such a good job on this figure otherwise that you won't mind. Once you get used to the color, you'll have a hard time imagining him in brown. Be careful with the shoulders from the start and no problems should arise. If you're a DCSH fan, then yeah, definitely get this one - there's no saying if you'll ever have another chance.